Gantsilyo Guru: Crocheted Bouquet Is Here!!! A lovely bride just held this while walking down the aisle this afternoon. I was asked more or less 2 months before the wedding day to take on this challenge. I think it was a brave move for the couple to have their boutonnieres and bridal bouquet crocheted. 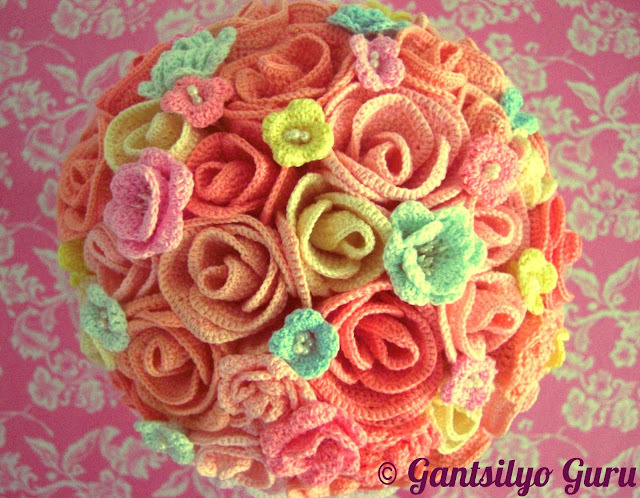 I even think it's the first time a bride will be holding a full crocheted bouquet in the Philippines :p I'm glad they liked it. Good thing about this bouquet is, it won't wither! The idea of crocheting a bridal bouquet was unfathomable for me. I mean, it's not just some crocheted bouquet. It's the bride's. It's that bouquet she will be holding when everyone's attention is focused on her while walking down the aisle. I was asked to use coral-toned colors - in line with the wedding's theme. I also added pops of other colors to make it more "alive." I didn't shy away from crocheting different kinds of flowers. I think the variety added character to the bouquet. 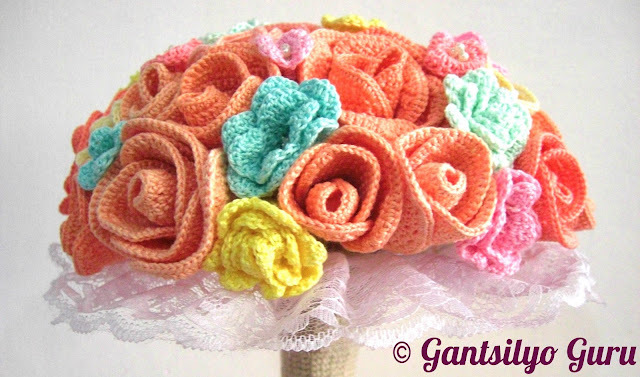 Did you know that the biggest challenge in making this bouquet is not the crocheting? It's actually the assembly. I'm not a florist or floral designer (if there is such a term) so I had no idea how bouquets are put together. I didn't know how some of those bridal bouquets achieved that seemingly round shape. But I took the challenge one at a time. I did research and consulted experienced florists. In the end, it all worked out. The holder of the bouquet is even crocheted. Can you see it? I couldn't make it to the wedding, unfortunately. I'm really looking forward to the official wedding pictures! Now I'm wondering what my next crochet challenge will be :p I think by now I can say, I'm up for anything! See my work in progress for the bouquet here. Incredible and wonderful combination of colors!!! That's a bonus for any bride. Do you have a pattern for this? My girlfriend asked me to make the bouquets for the maid and matron of honor. I have one year but I am also making her dress. I have not done 3D flowers before and would love to use your pattern. Hi, Are you selling the pattern yet? Very Beautiful and Lovely! <3 I love the colors and its over-all look! :) It's very inspiring, keep up the good work! I am too, a crocheter and when I saw your work - I was in awe! :) God Bless! I love your roses and the flowers!!! Do you have a pattern? I MUST have the pattern for those roses!! Please please please! I want to crochet my own bouquet for my wedding but I'm not a huge fan of most flowers I'm finding. But those roses! They look real while still being beautifully crocheted. Please please, can you tell me how much the pattern for the rose would cost?? Excelent work! Your details are perfect! Congrats! I'm looking forward for the pattern, so if you one day have it please let me know! Hello! Is there a pattern to buy to make the Wedding Bouquet? They are beautiful! Flowers, no wonder, are one of the best presents suitable for any occasion. At some places, purchasing flowers are somewhat expensive. But in the Philippines, buying and sending flowers is less expensive and hassle free. View this flower voucher codes and This article shares how to send a gorgeous bunch of flowers using the internet without spending too much. 2nd Wave of Coffee, Cupcakes, and Crochet! 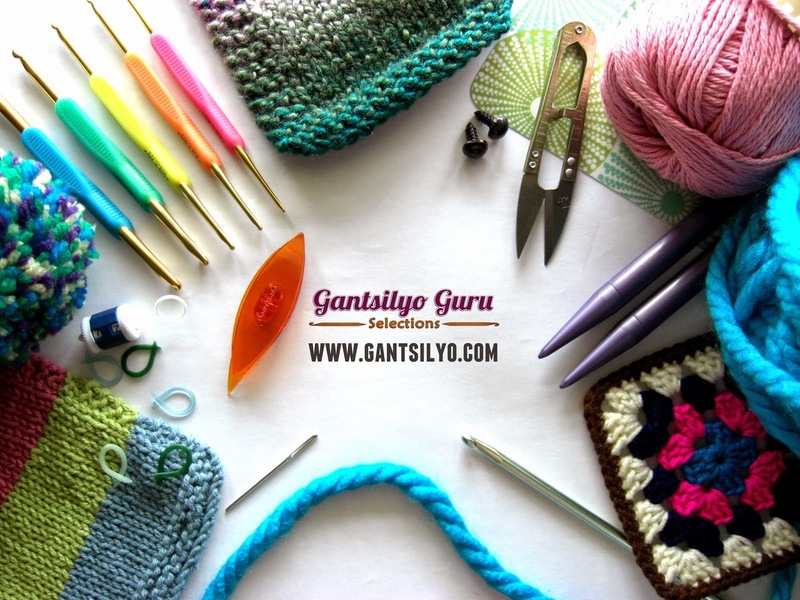 Amigurumi Workshop at Craft MNL on June 22! 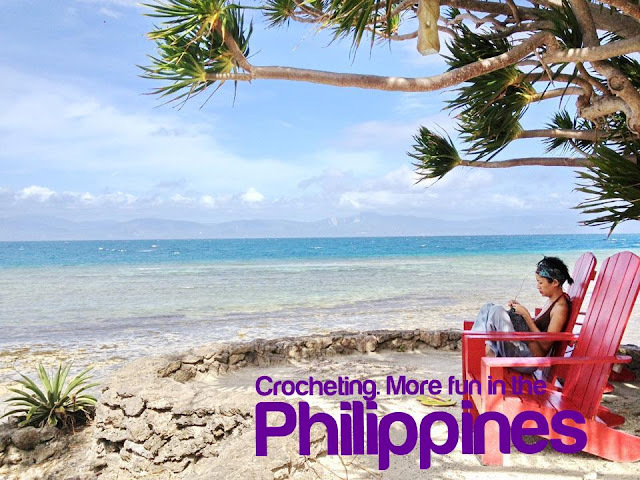 Basic Crochet Workshop at Craft MNL on June 15! Back In Cebu! There's Crochet, Of Course! Day 2 of Coffee, Cupcakes, and Crochet! Day 1 of Coffee, Cupcakes, and Crochet!